Grease bottom and side of 6-quart slow cooker with 1 tablespoon butter. In very large bowl, mix eggs, coconut milk, 1 1/2 cups coconut, dried pineapple, sugar, vanilla and salt. Add bread cubes; toss to coat. Pour mixture into slow cooker. Let stand 30 minutes or cover and refrigerate up to 18 hours. Cover; cook on High heat setting 1 hour. Reduce heat setting to Low. Cover; cook 2 hours longer or until puffed and set. In 2-cup microwavable measuring cup, place reserved pineapple juice and enough water to equal 3/4 cup. Stir in cornstarch and honey with wire whisk until smooth. Microwave uncovered on High 2 minutes 30 seconds or until thickened. Stir in rum. Microwave on High 30 seconds. Add crushed pineapple and 1/4 cup butter; stir until butter is melted. 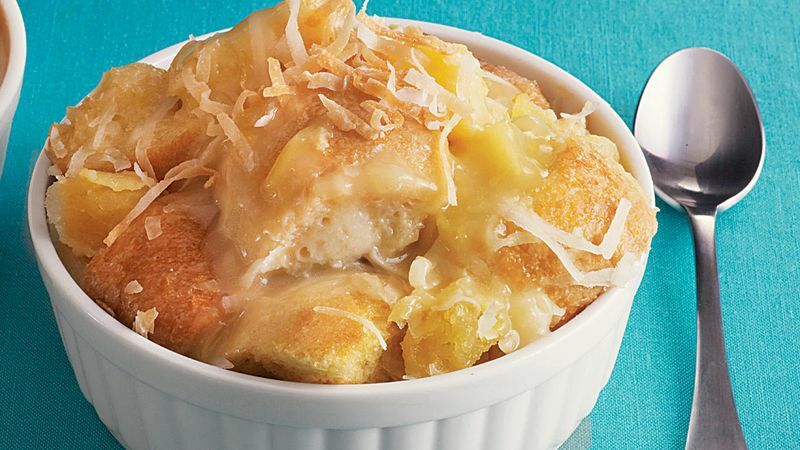 Serve warm bread pudding with pineapple sauce. Garnish with toasted coconut.